My Kurdish friend tries to explain the reason why Kurds use so much water: over 700 liter per person per day. Compare that to the 150 liters that the Dutch use – even though Holland is a country with much rain and plenty of water. ,,Do not leave the tap running when you brush your teeth!’’ my mother would warn us children. That stays with you for a lifetime and sure keeps you from wasting water. And even more: it has given me a sensitivity against any water wastage. Water cleans, and a lot of it cleans even better - that is the simple believe of most in Kurdistan. You can see that daily, in summer and winter. Women, men and children are hosing down the streets, trying to get rid of dirt and dust, but mainly getting rid of carefully cleaned, precious drinking water. That is pumped up from deep wells, lakes and rivers – and is for the main part lost after it hits the streets. Since I have lived in Kurdistan I have been fighting with cleaning ladies, who did not only waste water but also ruined wooden floors and furniture legs. Yes, water cleans – but only when you use it with the right equipment and in the right way. And I know, as I am from one of the cleanest countries in the world. Use a bucket; I tried to tell the cleaners, mostly housewives who had learned from their mothers that much water cleans better. Use a bucket and a cloth, and do not make things too wet as the material cannot stand it. My country even offers a training course to cleaners. But my Kurdish cleaners would not listen to me. Possibly because cleaning the Dutch way costs more energy. You have bent your back many times to clean the cloth in the bucket. When using a broom to sweep the floors, you need more human power than when chasing dust with the water hose. After sacking a number of cleaners, the net result is that now I am desperately looking for a cleaning lady that can clean and yet does not waste the water. Most of the foreigners I know in Kurdistan have finally employed an Ethiopian or Bangladeshi cleaner. This is taking jobs away from the Kurds, but what to do? We want our houses cleaned in such a way that we are satisfied, and not in a way that the cleaner way proudly says how 'zohr pak' it is while he or she just threw some water around and wiped that away again. It’s time Kurdish mothers realize that a lot of water does not do the job. That less, applied well, is much better. This was published in Kurdish as a column in Kurdistani Nwe. My guests who come to Kurdistan always ask for an adapter, so they can use their European plugs. When I had just started living in Kurdistan, so did I. I bought a number of adapters, but somehow they were always untraceable when I needed them. And if they were there, they did not work. So very soon I was doing what everybody does: pick up a pen or a key, push that into the top of the three holes in the socket to disable the safety catch, and then push in the plug. I recently visited Great-Britain, and did something that I would never even have considered when I was living there, years ago. I searched my hotel room for a socket that would allow me to do the Iraqi trick, so I could charge my phone and computer. Most of the sockets had square holes, and the plug would not fit. But in the end I found one that did work. If that is the influence of Iraq, perhaps it is not too good. Because safety is a big issue in England, all the sockets have a little label which says when they have been checked. The bathroom has stickers warning that the water is hot (hurray, that’s what I wanted) and that wet surfaces might be slippery. Safety means something completely different there than in Iraq and Kurdistan. Here you learn how to live with danger. In the beginning, I would not go to Kirkuk because people around me said it was dangerous. Then I found they did not go there themselves, so they hardly knew the situation. I went, and after a few times I even stopped wearing the scarf that was supposed to make me blend in. Now, when my stringer suggests I wear a scarf, I ask him why. And if he does not have a reply that convinces me, I will not do it. Because if you know where the dangers are in Kirkuk, you can try to avoid some of them. Do not travel in the mornings, as most attacks take place in the mornings. Stay in the mixed and Kurdish areas, as they are considered the most safe. Yet it is hard to avoid passing the police headquarters in the city center, next to the reconstructed library, which needs new paint again after the umpteenth bomb attack on the police next door. Many destinations can only be reached by crossing through the center. When you talk to Europeans, they mention the bomb attacks in Erbil and Sulaymaniya of 2006 and 2008. I tell them that is past, Kurdistan is safe. I prefer not to mention the many times the checkpoints have stopped cars with explosives. 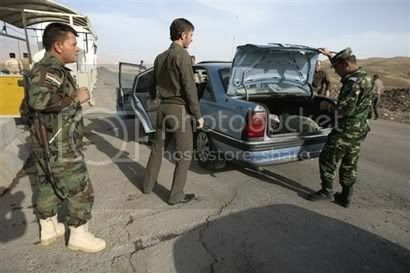 Because for us in Kurdistan, the fact that the security police is able to find them, is reassuring. For people from outside, the sole fact that explosives are found is scary. They will wonder how much is not found. We all know that the security police finds weapons and explosives in homes. But we cannot allow ourselves to worry too much and we are happy they are found in time. We have to live with the risk. And the more days pass into weeks and months without anything happening, the more we are convinced that Kurdistan is safe. Which it is - if you are used to checkpoints with armed guards, demonstrations under the guard of heavily armed men, gun shots in the night because of neighbors quarreling, a police action somewhere or because of shots in the air at some celebration, and guns as a normal occurrence in the streets. Like I saw in Chamchamal recently even a boy no older than fourteen walking around with a gun slung over his shoulder. We are used to that, and we even see it as one of the reasons why Kurdistan is safe. The armed guys are making sure nothing happens. Perhaps because we are so used to taking the risk, we do not even wonder about pushing away the safety catch in the electricity socket. Or simply even putting wires straight into the socket, without a plug at all. What risk is that, compared to the all the other ones that we live with?